For years, car buyers sought that luxurious “new car” smell. They even made air fresheners with the scent so drivers could keep the smell fresh for years. However, what many of us didn’t know was how toxic those odors can be. That “new car” smell can originate from toxic chemicals used in many of the materials in your car’s interior. From the seat cushions and door panels to your steering wheel and dashboard, dangerous chemicals leach from your car into the cabin air and even create a film or “fog” that commonly coats the interior windshields and windows. The two main chemicals that pose significant threats to your health are PBDEs (used as fire retardants) and phthalates (used to soften PVC plastics). Unfortunately, these toxins are prevalent in car materials, so it is important to take measures to remove both the odor and the chemicals themselves. Here a few ways you can eliminate these dangerous chemicals and rid your car of that strong “new car” scent. Heat is one of the best ways to flush out toxins from your car. High heat will catalyze the release of chemicals in the car in a process referred to as “baking out.” The method requires raised interior temperatures in the vehicle, a source of ventilation, and a final cleaning. Step 1: Raise the temperature. You can do this by leaving your car out in the hot sun or running the heat for a few hours. As the car heats up, chemical fumes will release from the interior materials into the air. When the chemicals begin to release, be sure that you have a way to ventilate them out of the car. While your vehicle is out in the sun (or the heat on full blast), crack the windows a bit to allow the fumes to filter out into the air. Once you have baked out the car, open doors and windows wide to completely air out the interior. Then go through the car with a microfiber cloth and a non-toxic cleaner-deodorizer such as ODOREZE™ Multi-Purpose Odor Eliminator Spray. This concentrate is made from 100% plant based ingredients and can make up to 60 gallons! Dilute ¼ oz/gallon water, spray and wipe down all interior surfaces. You may want to do this a few times, depending on the severity of the odor, but this process is an effective way to not only clean out the headache-inducing smell, but also the hazardous toxins themselves. You can use any deodorizer left with your household detergents to keep your home smelling fresh. Another simple method of deodorizing your car is to absorb the smell. You can purchase and use professional strength odor eliminators like the SMELLEZE™Car Smell Deodorizer Pouch and SMELLEZE™Eco New Carpet Deodorizer Powder for the best results. This product is specially made to remove toxic new car fumes. To use, simply place SMELLEZE™in front, back and trunk areas (under the seats, in your cup holder, etc.). It effectively eliminates unwanted car odors at their source by absorbing the odor causing molecules, neutralizing them, and encapsulating them so they are not released back into your interior. As an added benefit, it can be used over and over again until all the chemicals are completely removed and your car is safe to ride in. This natural household product can also be used in conjunction with the pouch described above to accelerate the removal of the new car smell chemicals. Just sprinkle on your carpets and seats and let it sit for at least a few hours or several days, and then vacuum. The powder draws out the new car chemical smells like a magnet before they can be released and absorbs them like a sponge. 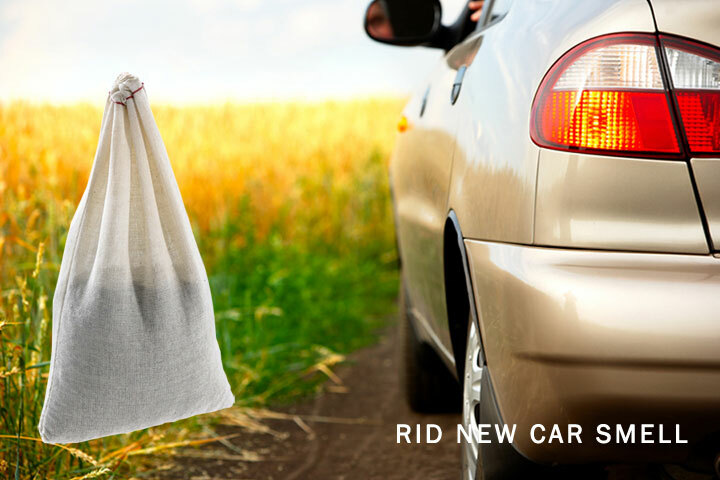 This process will shorten the time it will take to drive and enjoy your chemical-free new car. Filtering your air is an excellent way to ensure you aren’t recirculating toxic fumes. Set your car’s vent to outside air, rather than recirculate, and drive with the windows down—particularly on hot days—to air out the car. You can also invest in an activated carbon (charcoal) filter like SMELLRID™ Activated Carbon Smell Removal Filters, which effectively absorbs and traps contaminants in the air. The convenient 4″ x 4″ charcoal filter comes six to a pack with adhesive strips on each so they can be easily attached to your car vents. This filter will aid in removing the new car odors as your air recirculates. It uses the same technology used in industrial odor filters and is very effective. Before you invest in a new car, do your homework. Many manufacturers are taking steps to improve the safety of their materials. From Honda to Toyota, there are safe and healthy options for all car owners. Check your favorite dealers to see which cars are best for you. Ridding your car of harmful odors and toxic chemicals can take time, but it is well worth your effort. So take a deep breath (but not too deep), and get started. You’ll be driving a mean, clean, driving machine before you know it! Connor Adkins Connor Adkins is a mechanic and loves working on classic cars. He also occasionally writes for a Honda dealer in Hollywood. Connor helps people stay healthy and fit, and enjoys spending time with his wife and three children. Going forward, how best do I really clean the car to rid it of poisonous gases? Can I do as suggested above? Firstly, you can sprinkle Smelleze® Natural Carpet Smell Deodorizer Powder on your carpeting and seats to draw the any absorbed chemical odor out before it’s released into the air. Allow it to work for at least a few hours or overnight. The longer the better. Then simply vacuum and repeat the treatment, if necessary, until all the odors are removed. Secondly, use Smelleze® Reusable Chemical Smell Deodorizer Pouches to eliminate the toxic airborne odor invading your cabin. For a breath of fresh air, simply place Smelleze® pouches in your car and smell the difference! You can set the pouches in the front, back, and trunk areas on the seat or floor. You can use 1-3 pouches depending on the severity of the new car odor. This is an effective treatment for the chemical smells that are outgassing slowly since the Smelleze® pouches work continuously 24/7 to eliminate odors which otherwise would be reabsorbed to continue this cycle. Just got a new vehicle and I’m having horrible sinus irritation from the fumes. I have it out in the sun with windows down and considering using the Smelleze products to help absorb the gases. Do you know what the active ingredient is in the powder and pouches? I’ve heard that it’s zeolite? I would definitely recommend using our SMELLEZE™ Reusable New Car Smell Deodorizer Pouch to absorb some of those fumes. I also highly suggest using our Smelleze™ Natural Chemical Odor Remover Granules on the seats as well as the floor to absorb the chemicals faster. Smelleze is made from a 100% all natural metal oxide odor eliminator consisting of sodium, potassium, calcium, aluminum, and silicon.